I know this blog has been non-stop purim treats recently. And I know that Purim is this week and most of you already have your Purim planned out, if not done. And I know that there should be some kind of witty introduction written here. Some kind of story, or a clever joke. Or maybe something to get everyone into the Purim spirit. But I must admit, I am exhausted. Too exhausted to write. Because every time I try to think of something to write by way of introduction to this post, I think about the crazy day I had at work today. I think about the million emails I didn’t answer (or so it feels. In reality it was probably more like 50) and the 29 orders I haven’t finished. (Not that I counted or anything.) And I am thinking about how I probably shouldn’t be writing this now that I’ve introduced my coworkers and possibly my manager to this blog. So just for today, we are going to skip a coherant introduction. I’ll sum it all up real simple for you: these are delicious. These are easy. These are perfect for your Purim Seudah (Feast). So if you need one more delicious dish? Make this one. In a medium mixing bowl, combine meat, salt, onions and pepper and stir to distribute evenly. Place a small amount of the filling (about a teaspoon, no need to measure!) in the center of a circle. Dip your finger in water and rub a bit of water around the sides to help the wonton wrapper stick. Raise two arcs on the side of the circle to meet in the middle, then bring the third side up to meet the other two. See here for Hamantashen shaping tips. Press together well to seal, leaving a small opening in the center. Heat the oil over medium heat in a large frying pan. Once the oil is hot (wontons should sizzle as soon as they hit the oil) fry the wontons on medium heat for a couple of minutes until golden brown. Flip and fry on the other side until golden brown. Remove from pan and place on a paper towel to absorb the excess oil. Serve hot, preferably with a soy-sauce dipping sauce. ***By the way- I think this goes without saying, but these work as a delicious appetizer in any other shape for non-purim occasions. Duh. so clever. 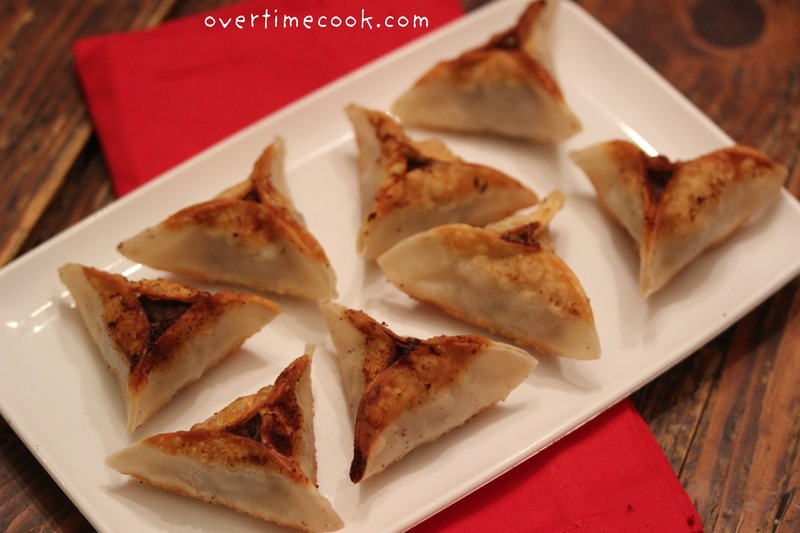 nice to see hamentashen that are savory! Oh, these look yummy! 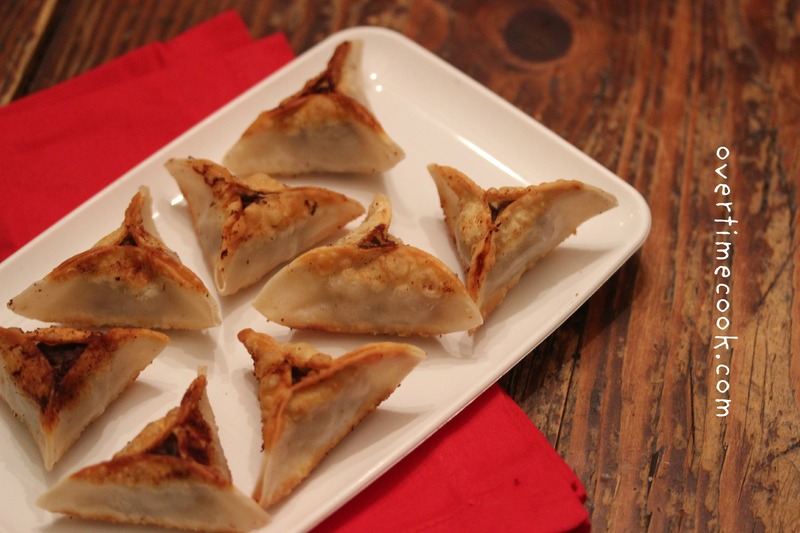 And I love that you serve with a soy dipping sauce…perfect! I’m sorry that you are feeling overwhelmed at work. Hopefully you can manage to get your workload down to a manageable size soon. Hey I make something similar to this and add cabbage. I make them into eggrolls. 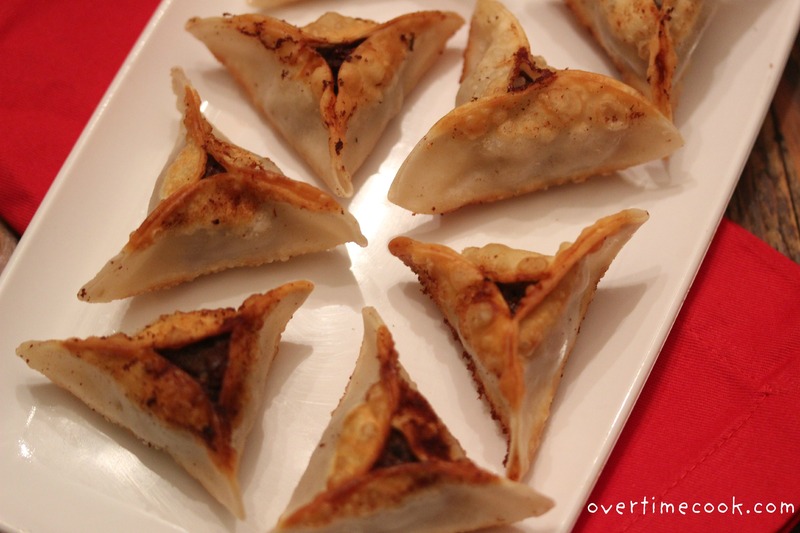 I love the hamentashen idea. I usually “fry” it in a little oil cuz i am not a fan of frying. With the hamentashen shape and the little bit of oil, will the mixture spill out? I serve it with duck sauce. I pinned this! Just found your site and am excited to find some new exciting recipes! Thanks! I love this idea ! Can I make them in advance and freeze them? Thanks! And yes, I did that and they were great. Can these be fried in advance and rewarmed? They look delicious, but I can’t see myself frying purim morning. Yes, you can fry them in advance and freeze. They where really good, however I found the meat a bit hard. I added an egg to the meat mixture and it was great. Do you mean plain soy sauce to dip? Hi if you fry and freeze -what is the best way to defrost and heat?